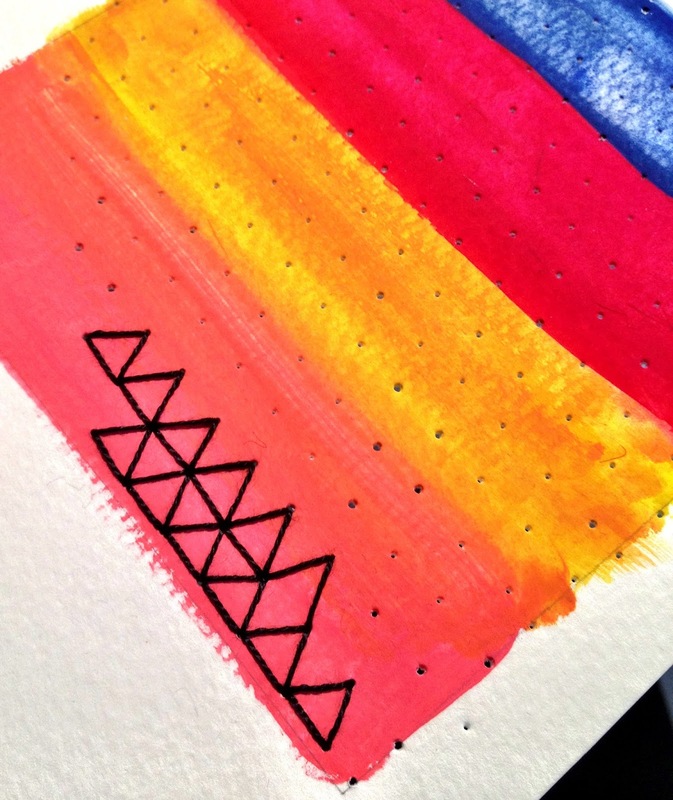 Q: Is there such a thing as too much color and too much pattern? 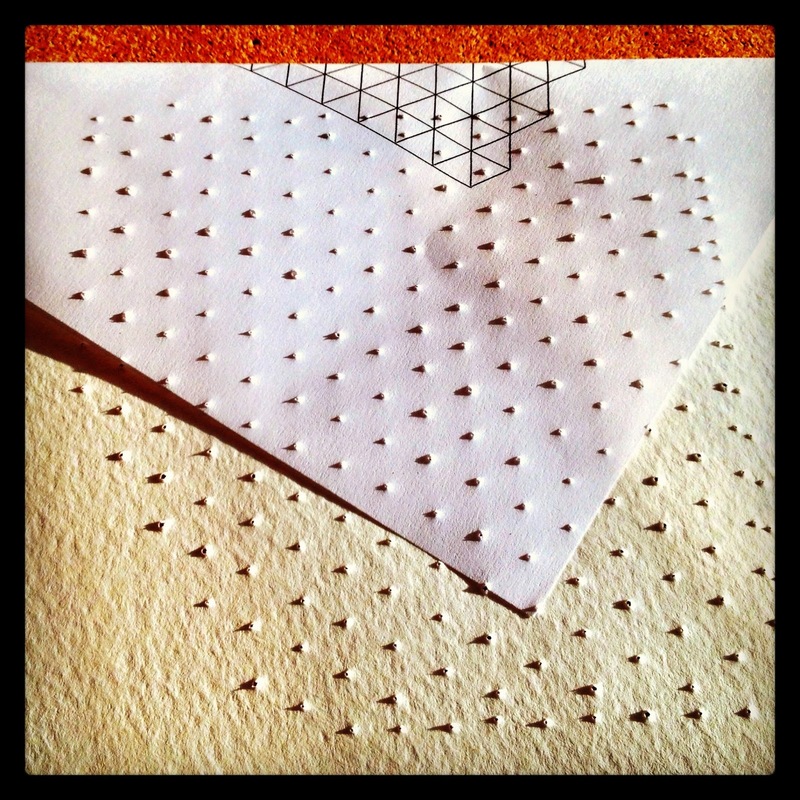 Fresh set of holes poked, ready to stitch. Looks like Braille. My pile of "not quite rights" is growing. But that's OK. I'm learning. The piece below doesn't quite work. I threw in too many colors and too many patterns. I was trying to work in more of a scene, with foreground and background activity. But I piled it on too high and it's simply too busy and not unified. Blooper! I think it fell apart with the blue stars. Among other things. So on to the next piece. Simpler grid. Simpler color selection. 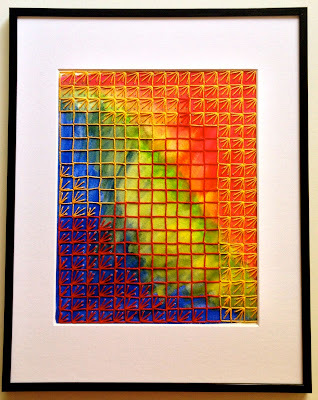 Trying to strike a balance between wild grids and doodles on a luminous colored base and composing different areas of focus in different places. Brand new grid. Keeping it simpler. Perhaps I've dialed this one to too simple. We'll see. Not much time to work on this this week because I'm moving on Thursday. Moving is a beast! But I'm very excited about my funky new duplex and the next phase of my personal life. 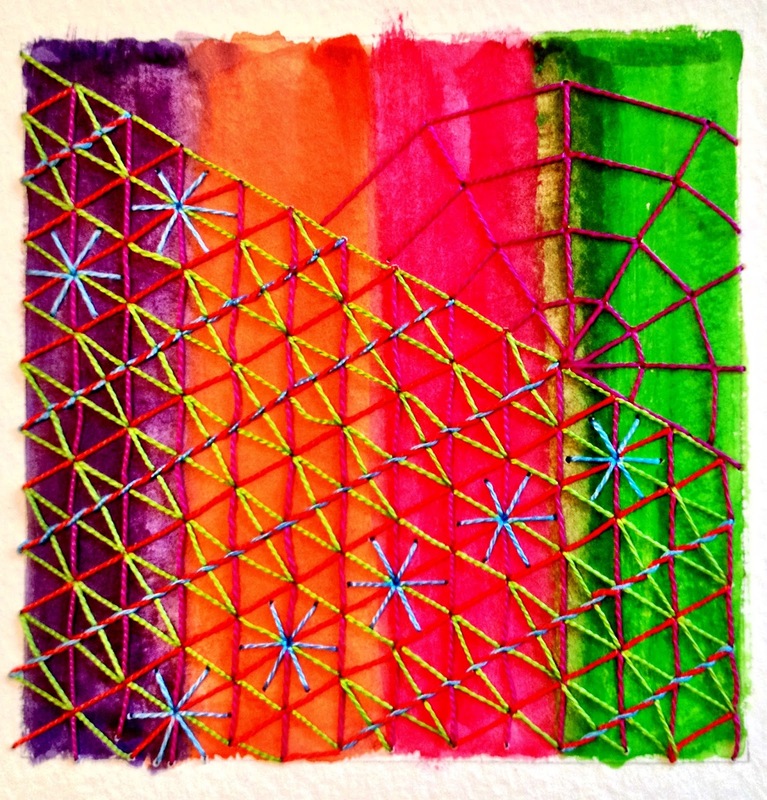 More scenes from my recent work with watercolors, pattern, colors and threads. 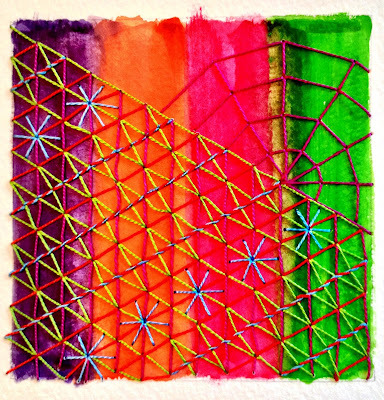 Honeycomb 1 (2013) Watercolor & pearl cotton thread. 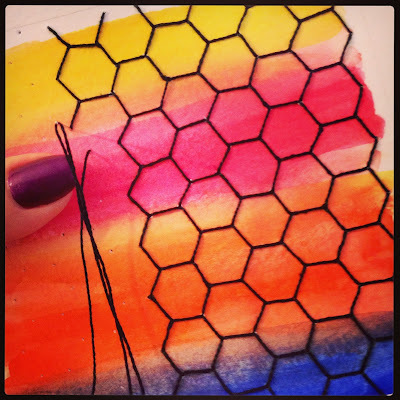 WIP: Honeycomb 2 (2013) Watercolor & pearl cotton thread. 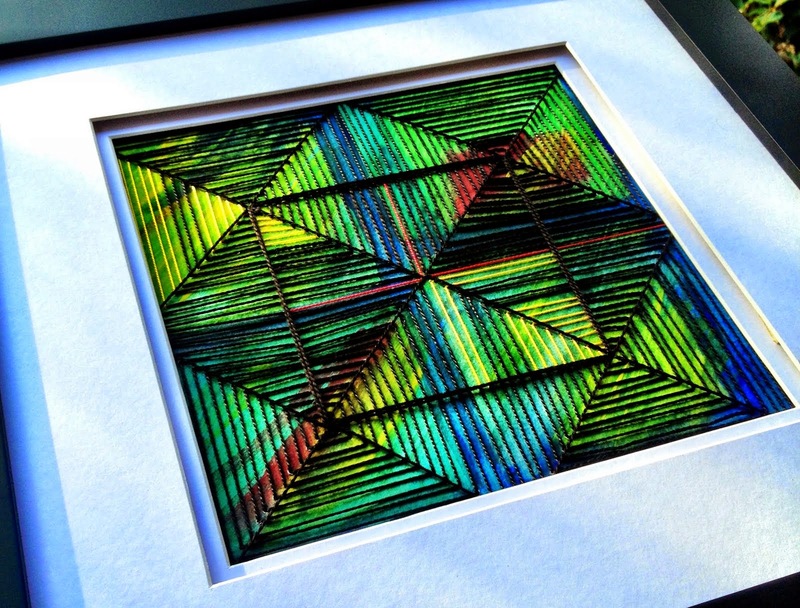 Honecomb 1 (5" x 5"). I'm teaching myself how to do this. Several have gotten messed up. I have piles of drafts. Playing with paint at my table. 140lb watercolor paper. 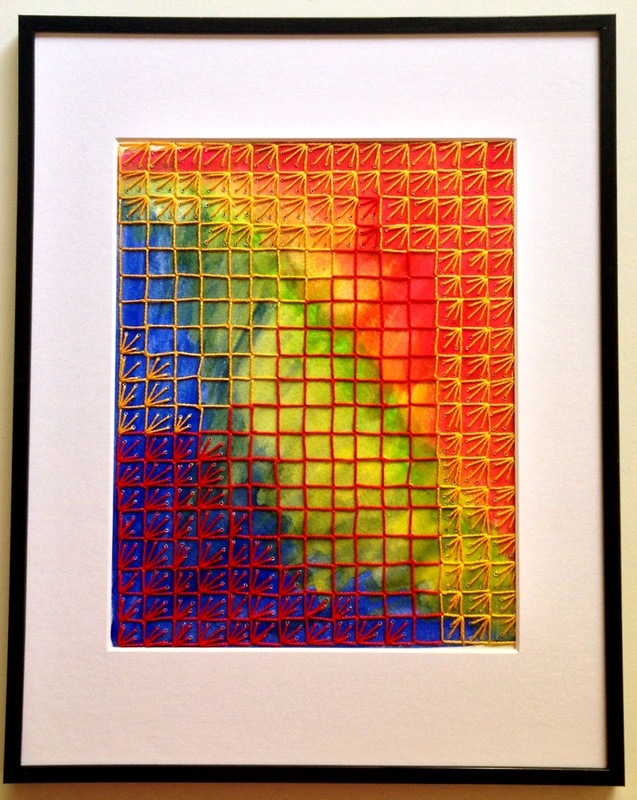 Honeycomb 2 (2013). This one got a little messed up. Oh well. I know it's right for me because I'm having so much fun with it. How did I not do this before? I love the saturated colors of watercolor paints. And I love the texture of pearl cotton. 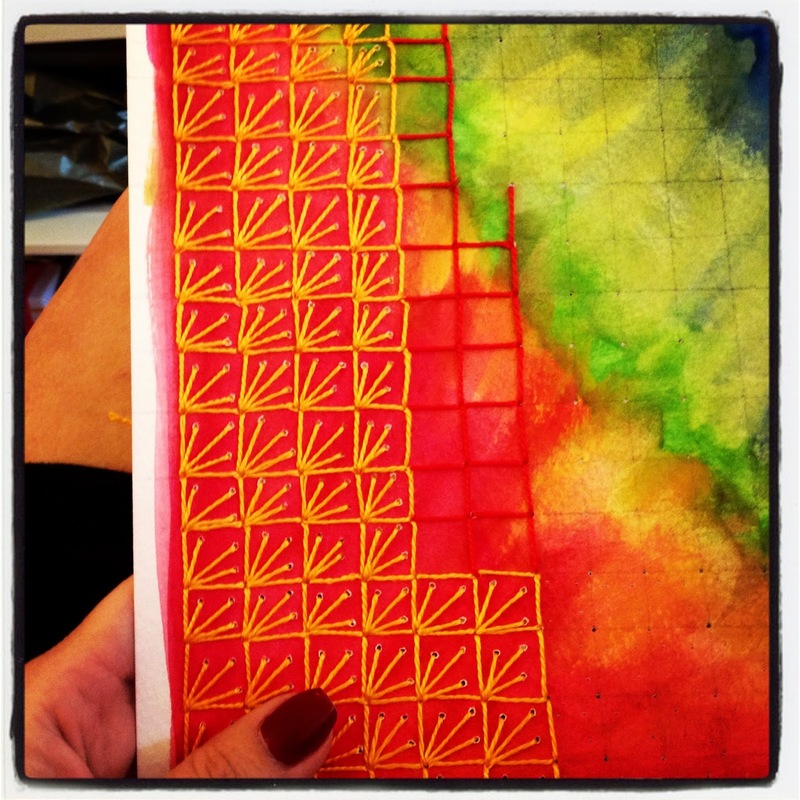 And I love layering these with various grids. Grid 1, 2013. 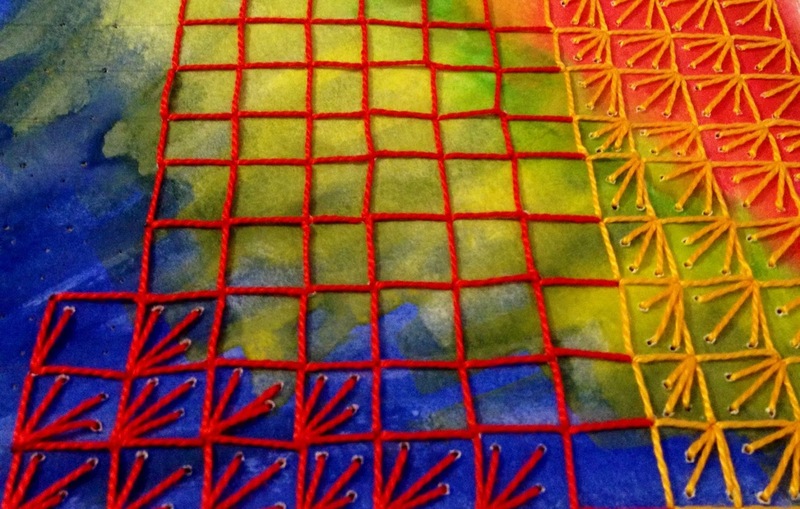 Hand embroidery on watercolor painting. Right now I'm playing and experimenting with painting simple backgrounds and grids. Hex grid 1, WIP. Hand embroidery on watercolor paper. And fortunately there are soooooo many options for both! In my non-art-making life, it's been a difficult week, filled with transitions and strange medical news. But so many good things and good people. I'm about to move to a new, very sunny, funky duplex in my favorite Durham neighborhood. And to top it off, it's right next door to my sweet friend Kate and her husband Chris. Kate has amazing, sick skills in the kitchen and at the sewing machine. I will be learning so much from her! She has already taught me a lot about baking, preserving and serging. I feel sad and full of passion, joy and life at the same time. I'm very excited about a new column that Jamie Chalmers (a.k.a. 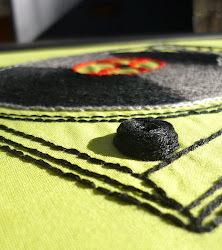 Mr X Stitch) invited me to write on the Mr X Stitch website, a large-scale, international blog at the forefront of the contemporary embroidery movement that is celebrating its fifth anniversary this month. Interview on Mr X Stitch, Aug 6, 2013. 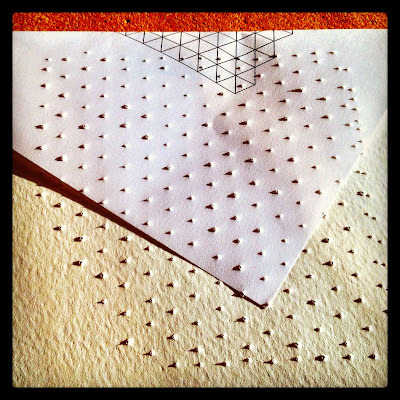 The new monthly column is called Inspired to Stitch. It will feature interviews with artists, focusing on translating creative ideas and source material into textile art projects. Here is an interview Jamie did with me that ran yesterday on the big site. 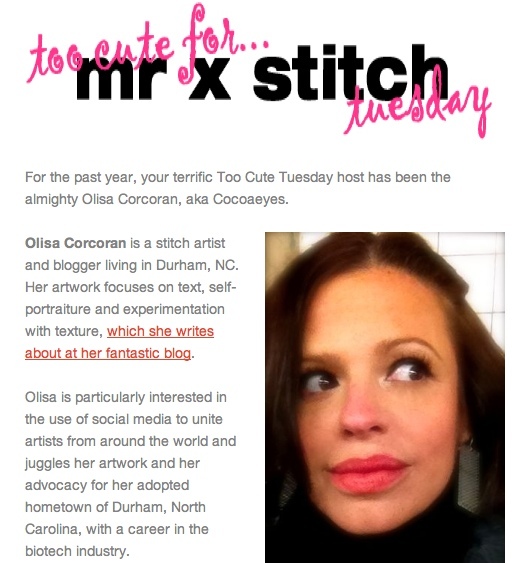 I will continue to write the Too Cute Tuesday column for the site (mind you, my sense of cute is a little... different.) Inspired to Stitch will run the first Tuesday of each month. Please send me your ideas, suggestions, questions... 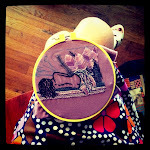 I'm thrilled to learn more about your creative process and sharing it with the thousands of readers at Mr X Stitch. 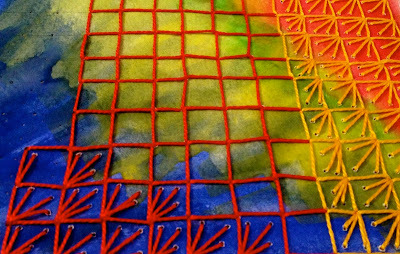 I'm really, really having fun with the stitching into watercolor paper. 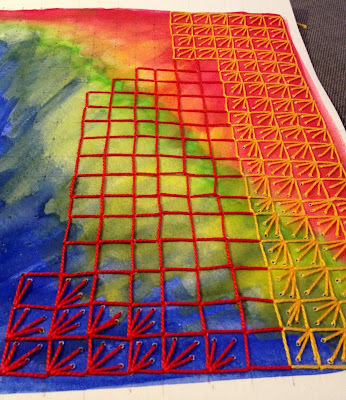 WIP, Size 5 Pearl cotton over 140 lb watercolor paper. 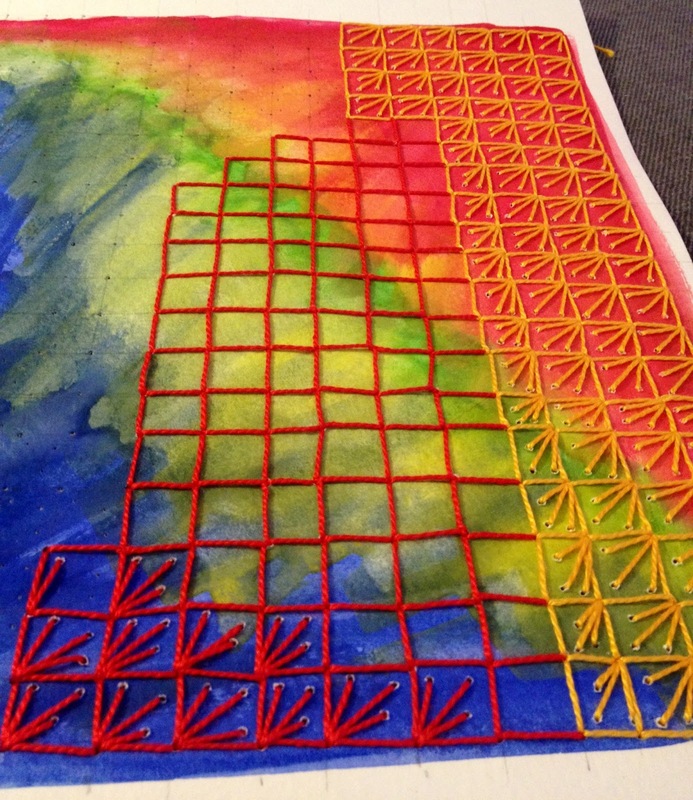 Especially the layering of a the stitched grid over the painted, 140 lb paper. So much more satisfying than stitching into the pages of my sketchbook, but I'm still doing that, too. Finally, how cool does this jurried exhibition in at the arc studios & gallery in San Francisco sound? I think I need to design a piece and submit it. A show featuring Tom Waits-inspired artwork? Should I try? ?